Technology is a means to an end. That end is, having rayguns. Sorry for no posts for some time. I returned to USA three weeks ago on 18 July. My first week back I spent getting over jet-lag, doing some unpacking, and keeping caught up with work. 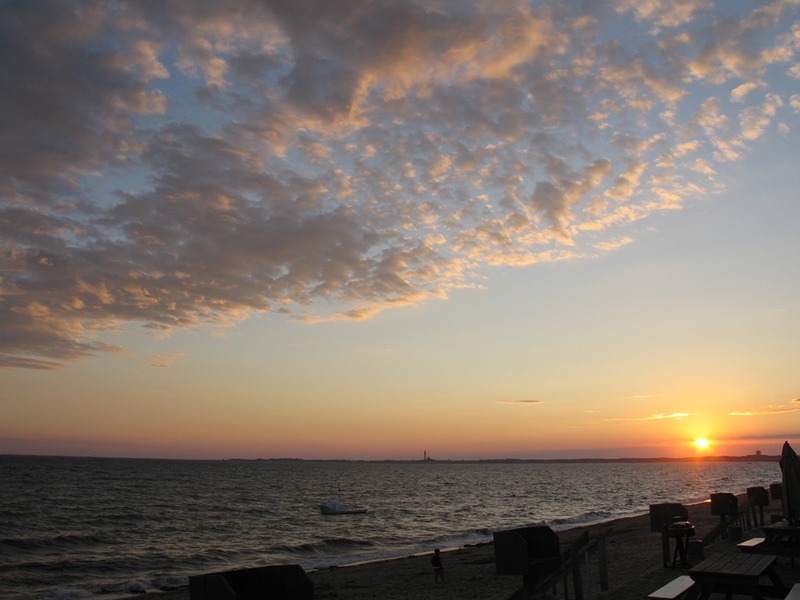 My real “reintegration” back into things here started the week after, when Kim and I spent a week in North Truro at the Topmast Resort, our long-time summer vacation getaway. We played some golf, saw some sights here and there, but mostly we sat on the beach, swam, read, kayaked a bit. Going to the Cape is for us a bit of a family ritual, and the familiarity of the place we’ve been visiting 15+ years helped bring my mind back here and away from the other side of the world. Since coming back friends and acquaintances of course are asking, “What was it like?” I still don’t have a proper answer. The time in India was enriching, since I saw so much that was new; yet is was also disheartening in that much of what I saw was very sad. The time was stimulating and satisfying, since I met so many new colleagues and friends, and (I think) we did great stuff together; but at the same time it was disappointing in that I feel I could have done much more. Finally the time was rejuvenating, in that it was an opportunity to look at my lifestyle and make changes, for the better I hope; and then it was exhausting in that it is hard work living in a place that is so different and where you are always on display. 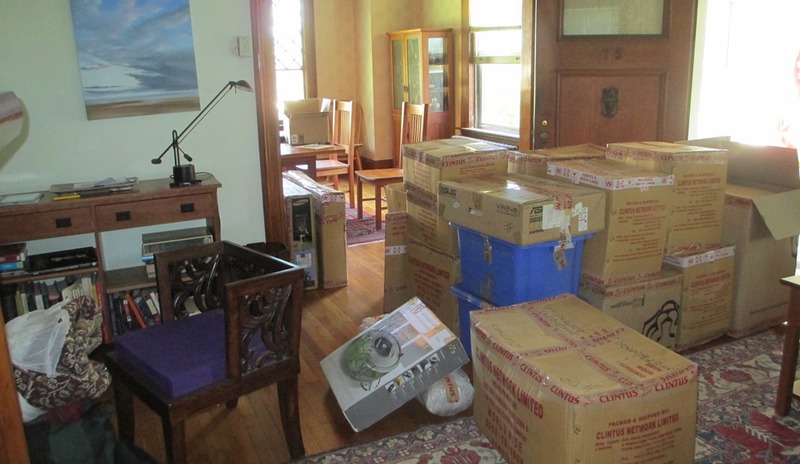 Above is the shipment of our India goods: kitchen items, books, clothes, rugs, mementos, etc. Also shown is our chair, which Kim now needs to have re-upholstered using some fabrics we brought back. Since I am greatly against clutter, we have to reorganize and/or dispose of lots of old things about the home, to make space for the new. I foresee it will be some weeks until our living room is navigable again. Finally to add to the mix, yours truly has a new job. Well, not 100% new. My job was Chief Architect for IBM Sametime; there my priority was the technical strategy for the product line, though I also had to do a lot to promote, explain and sell the product. Now my job is Director of Product Management for IBM Sametime – and IBM Docs – where I have ownership for the overall Sametime business, which means leading the development of the roadmap, negotiating budgets and investment, forging partnerships, and lots of evangelizing to customers. So to paraphrase Pete Townshend, it’s a bit of “meet the new job, same as the old job” – but I’m sure a lot will be totally new, some of which I hope to share in these pages. So, I’m back. India is not out of my blood yet, but I don’t think it ever will be, not totally. Yesterday with our grilled lamb I asked Kim to make a spicy cabbage dish we oftentimes had during our time in Pune, very similar to this recipe or to this one. I guess once a Punekar always a Punekar. Ok, maybe not totally wild, but the “life” part still applies. 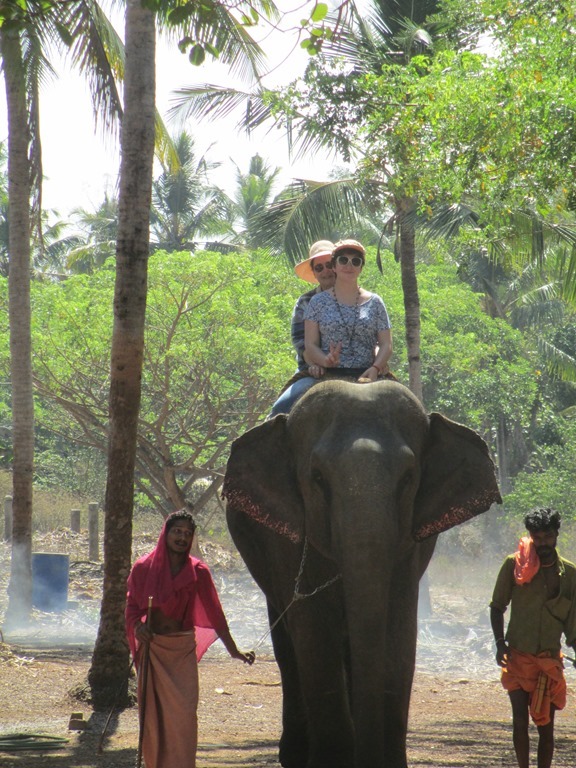 My last post on our Kerala trip starts with this pic of Kim and Morgan riding on Sundari the elephant. Elephants are extremely important in Kerala culture, and all festivals there will feature elephants. Our hotel was easily able to direct us to a place where they kept some festival elephants so we could see and ride on these amazing beasts. The ride that the girls took was short but still incredibly memorable. At one point Sundari, being led by her mahout balked at continuing the walk. After unsuccessfully trying to cajole the beast forward, the mahout called over another of his colleagues – this fellow gently talked the elephant into proceeding, as Kim related, much as a patient parent might talk to a small child. The dexterity of the elephant trunk is amazing. 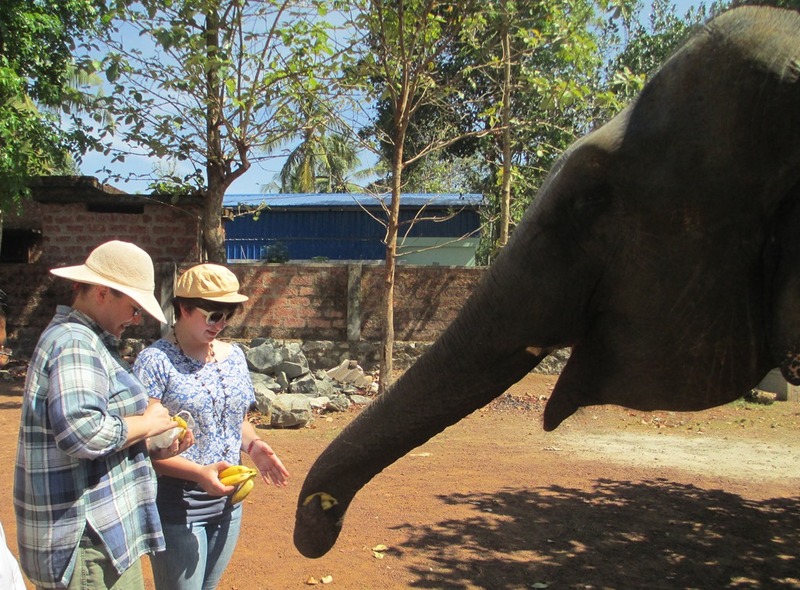 Sundari had no problem taking from our hands a single banana, or picking one up from the ground. I’m sure she could have picked up a pencil or a coin with equal ease. All 3 kgs of bananas – peels and all – were gone in about a minute. 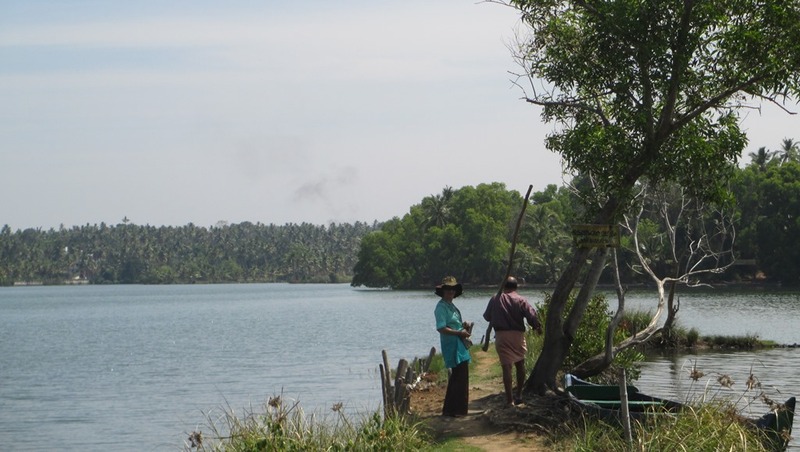 Another place we visited was Ponnumthuruth Island – in English, Golden Island. The name comes from a local legend that princesses of the Travancore Kingdom hid their golden jewelry there. Certainly all of India is mad over gold, but the fever seems to burn hottest in Kerala – with only 3% of India’s population, Kerala nonetheless yearly acquires 20% of the country’s gold. In 2012, the wedding of the daughter of the CEO of Muthoot Finance Co. (one of Kerala’s biggest banks) made headlines for the 5 kg of gold – over Rs. 1,47,50,000 (1.5 crore) or about $250,000 at current prices – worn by the bride. Then in a recent headline we see smugglers attempting to bring 1.8 kg of gold into Kerala from Singapore, hidden in printer cartridges, roller-suitcase axles, and other apparently not-so-clever means. On the actual island the main thing to do is visit the temples. There are three: for Lord Ganesh, Lord Shiva and Lord Vishnu. Pictures were forbidden, but we did observe a puja being made by the Brahmin for Lord Vishnu. Also just outside the temple walls were two shrines for snake-gods, one pair of gods devoted to Lord Shiva and another pair devoted to Lord Ganesh. A man was guiding us about these temples so I asked him, “In the north where we stay there are many temples for Lord Shiva and Lord Ganesh, but few for Lord Vishnu. Why is that?” He told me quite plainly: “In the north they are Aryans, light people, and here in the south we are Dravidians, dark people. That is why.” That I suppose is as good a capsule of the complexities of Hinduism you are likely to hear. That curved sort of bud in the center of the picture is the actual cashew. 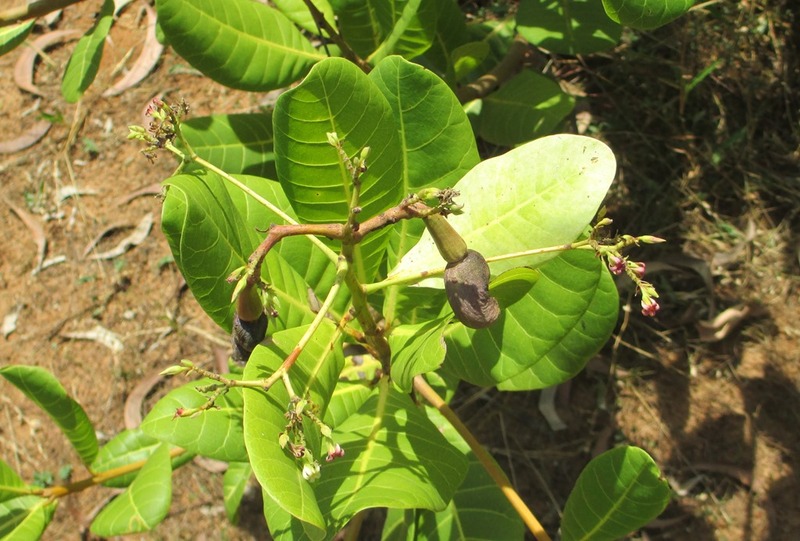 It is inside a tough and caustic husk and, when mature, the green pod above will ripen into a large, orange-red fruit. 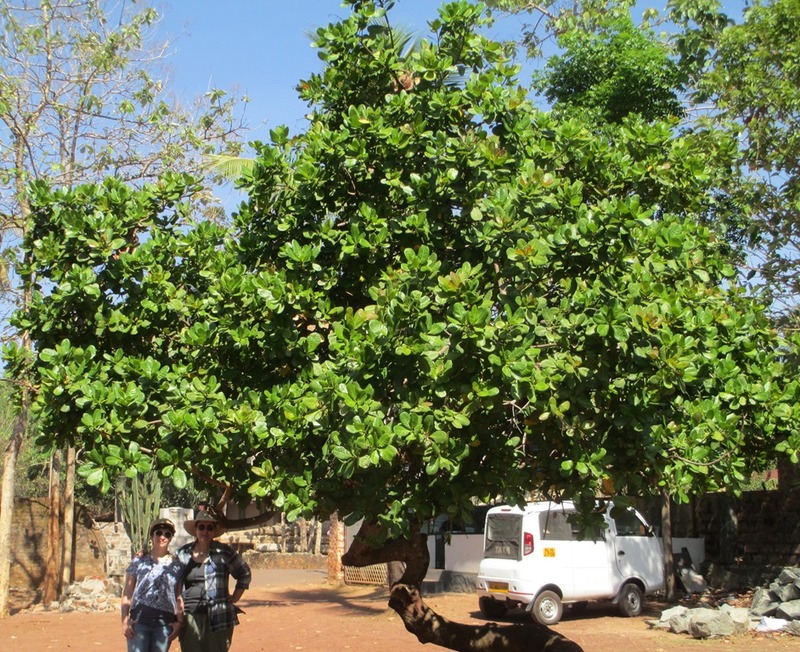 We tasted such a fruit growing wild there at Golden Island – the flavor was tart but not unpleasant, like cashew-flavored lemon drink. 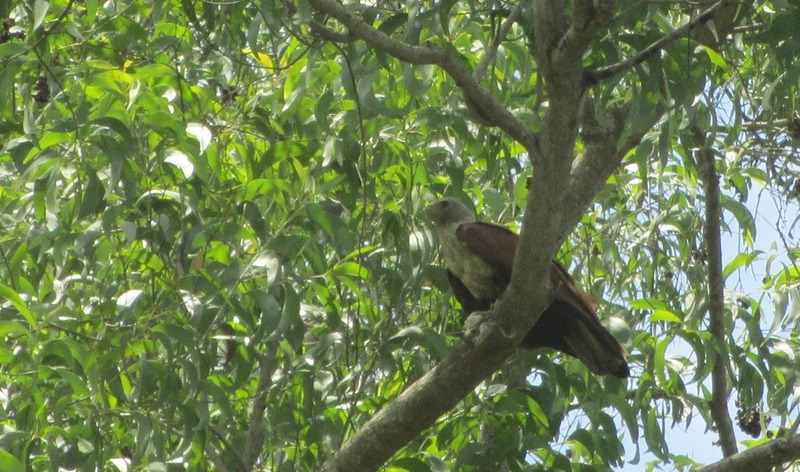 I believe this was most likely a Lesser Fish-eagle, or possibly a Brahminy Kite. I asked our driver, Who owns these nice houses? His answer came quickly: Overseas money. 2.5 million or more Keralaites work overseas, primarily in Persian Gulf states like UAE, Kuwait or Qatar; in fact when we visited London over end of year holiday, one of the managers at our hotel was from Kerala. With extremely high literacy and education rates, Kerala is in an excellent position to supply valued workers. Remittances from these workers are estimated about 49,700 crore (about $8B !) 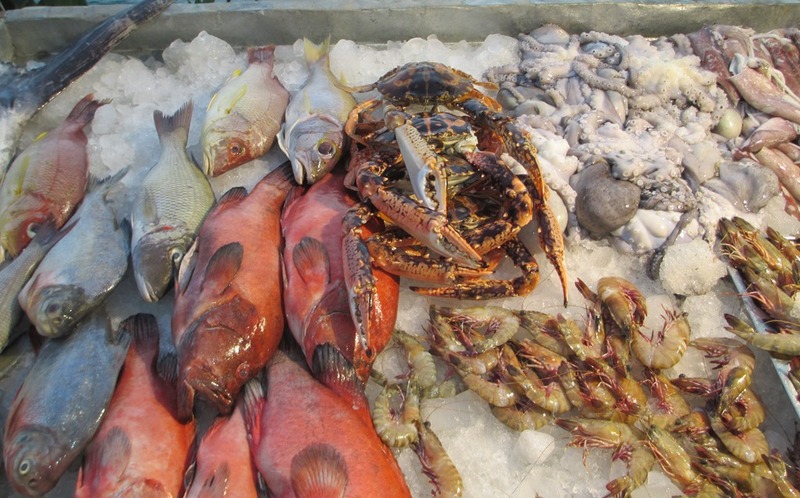 for 2011 – this is about %30 of the entire domestic product of all Kerala. The majority of these emigrants are Muslims. They follow a centuries old pattern of Arabian traders moving back and forth to India – it is called the Arabian Sea, after all. But nowadays, with laws changing both in India and abroad, emigration from Kerala seems to be on the decline. I think folks from the USA are often amazed to hear of successful communist political parties in other nations – it is part of the 20th century American narrative that we led the fight against communism, and that we won it too, making the world safe for capitalistic purveying of nifty consumer goods like smartphones and TVs which due to the self-created efficiencies of global markets are built in countries like China that just happen to be … communist? I said I would not be philosophical … sorry, almost done. I guess seeing all these unexpected symbols on our trip brought back to my mind that India has its own national narrative, that for modern, independent India starts with Gandhi and his vision of agrarian socialism. The founders of this largest democracy in the world were socialists – capitalism in the form we see in India today is a relatively recent thing, dating to 1991 and the introduction of new, liberal trade policies under then finance-minister, now prime minister, Manmohan Singh. 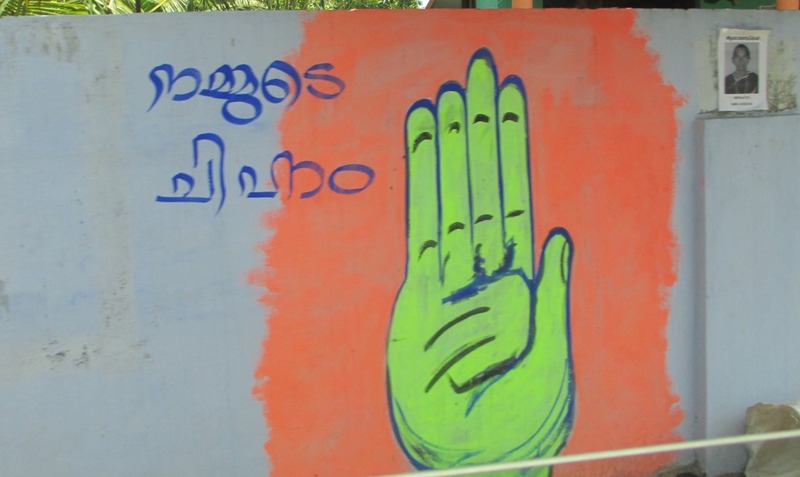 But for all the magic powers of capitalism and markets, Kerala seems to be doing fine with socialism; they have highest literacy and education rates of any Indian state, and in 2010 a UN study ranked Kerala highest of any Indian state on its human development index, an aggregate score combining per-capita income, life expectancy, education, and income distribution. 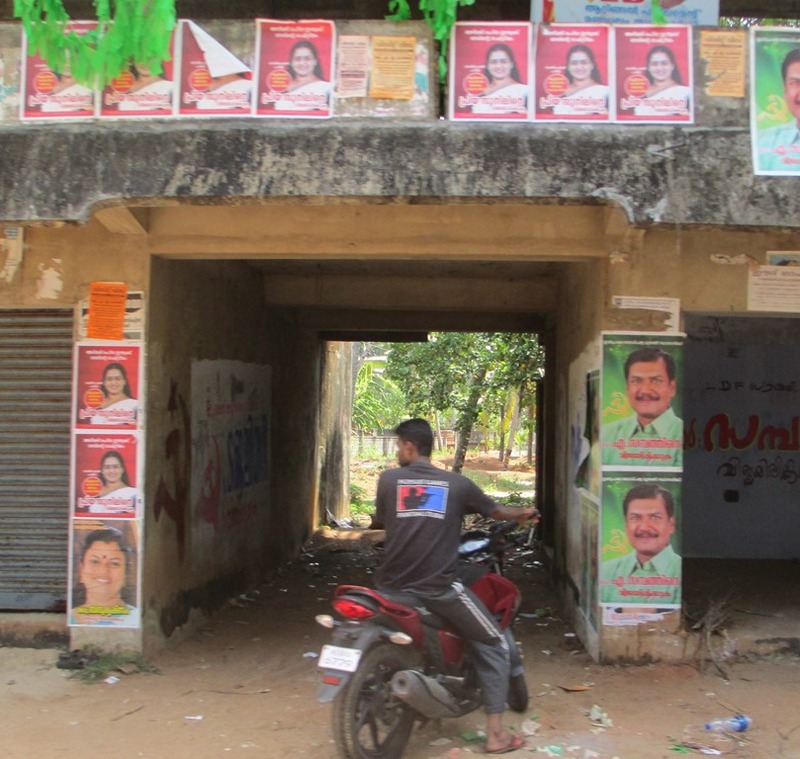 It is little wonder Kerala has small interest in the “Modi miracle”, as BJP top candidate Narendra Modi styles his achievements in his home state of Gujarat. Nothing deflates a discussion or a blog post so much as politics so I’ll stop all that now. 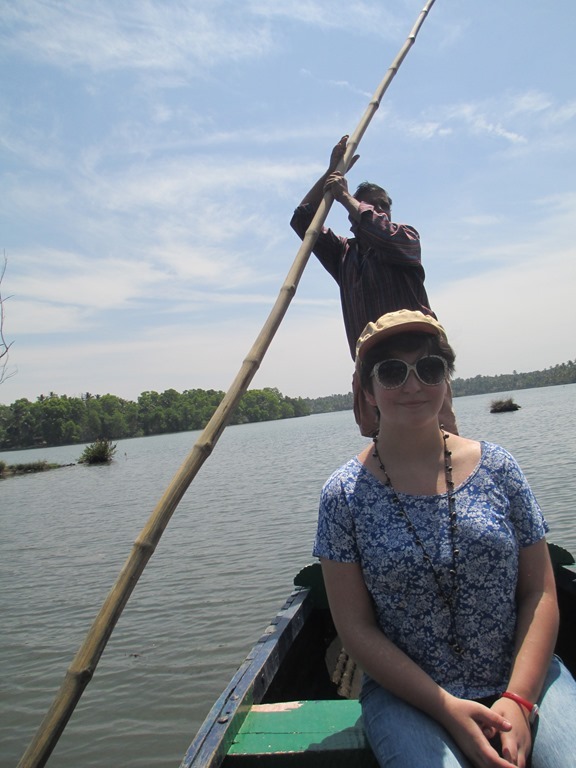 Here are some final images from Kerala: Morgan on our boat ride back from Golden Island; Kim and Morgan beneath a very large cashew tree at the elephant compound; and, fishing boats slowing working their way north along the coastline at Varkala Beach. The world is big and there’s much to see and so I can’t say I expect to be back to any of these places. I believe the images will stay with us. Only time and mind will tell. 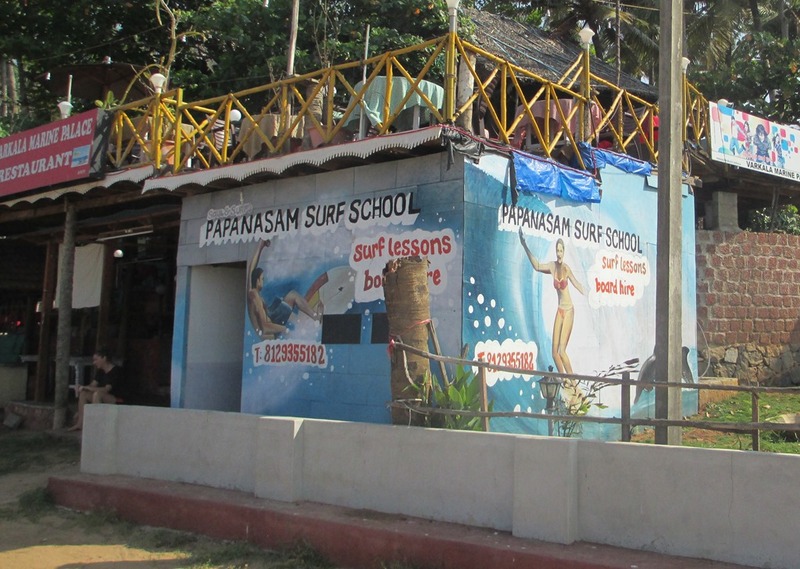 My last post told you about our trip to Papanasum Beach in Varkala, state of Kerala. Herewith a few closing odds and ends about this most delightful trip. I’ll begin with a dog-bites-man (almost!) story. 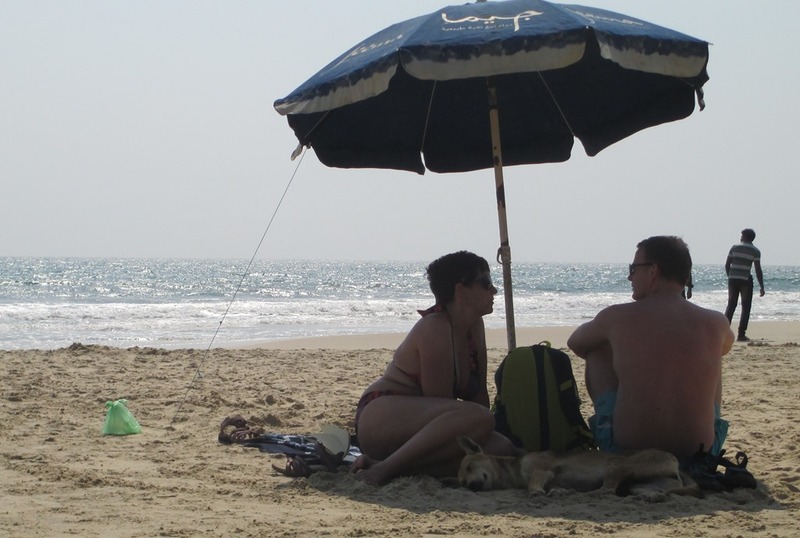 At Varkala Beach, like everywhere in India, there are wild dogs – though like everywhere else, there are not wild-wild, they are in a kind of symbiosis with people. The first day on the beach one of these dogs sauntered over to where we were, gave Kim, Morgan and me a quick look, then settled in for a snooze in the shade of my chair. This dog, in the left pic above, Morgan named “Sanchez” (sand-chaise, get it?) 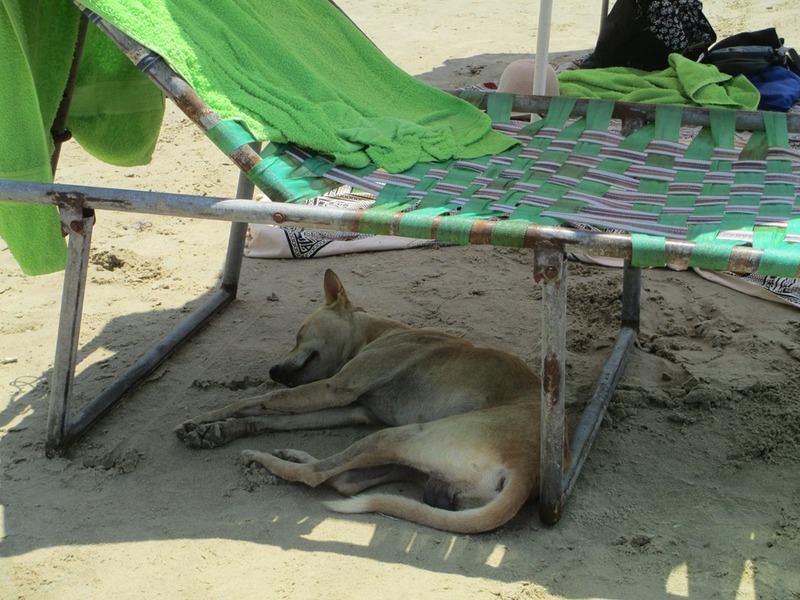 Two days later a similar dog came and snuggled up next to a couple sitting close to us on the sand; same time, a whitish dog came and sat in the shade of my chair. These dogs seemed really mild; you can pat them, scratch them, or just leave them be and they are content. They will take food if you give it, but they don’t go rooting through your stuff looking for snacks. Just nice dogs. It was that instant the doggy Delta Force leapt into action. Both my dog and the other couple’s dog tore off at top speed at this hawker, barking like Ravana himself had arrived from Sri Lanka. The hawker scooted away and the dogs came to a stop. Hawker gingerly steps in original direction – dogs launch themselves, nipping at his heels, very nearly getting a healthy portion of hawker-calf. The dogs stood sentinel a few moments more then, satisfied they had properly defended what needed defending, they return back to the shade to sleep. Not a single other person did they treat this way. Either the dogs have a refined sense of beach propriety – no hawkers allowed! – or they know this particular guy. As the hawker stood out of range, other people drew away from him, either having no interest in leaflets and/or not wanting to get caught in a canine crossfire. Final tally: Beach dogs 1, hawker, 0. Go, beach dogs! 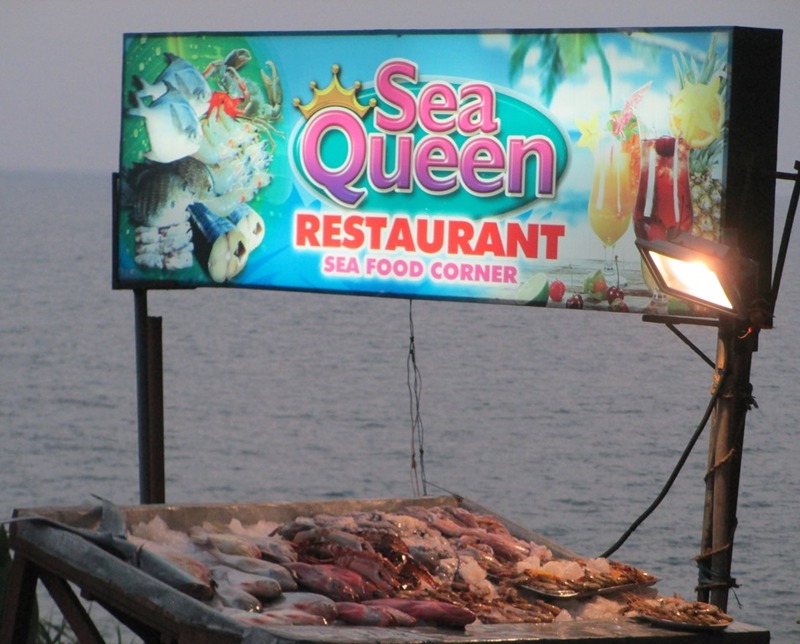 Varkala is on the Arabian Sea, and seafood of all kinds is abundant; each night we saw many lights out to sea that seemed to be a fishing “fleet”, but my camera could not well capture them. Red grouper, red and yellow snapper (but a different sort than we get in the Atlantic), dorado, crab, prawn, squid and octopus … and on other days they had some kind of sword-fish, kingfish, and one specimen a restaurant-tout assured us was barracuda – but they are salesmen and not ichthyologists, so we learned not to put too much confidence in those guys’ fish identification. 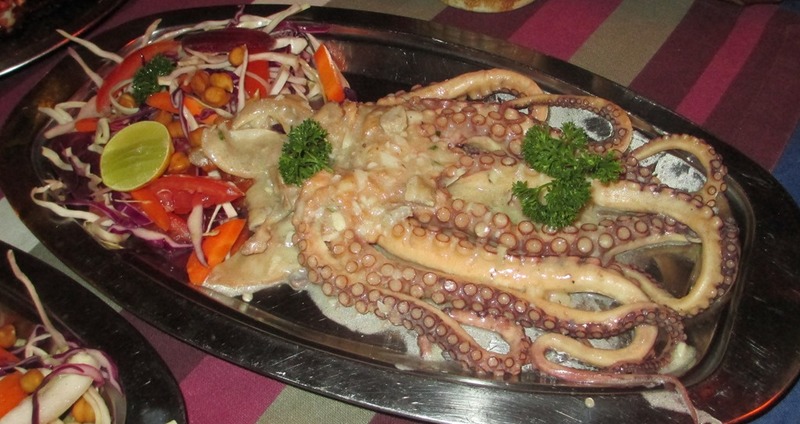 In order, fried calamari, a snapper done in the tandoor, then octopus (just barely sautéed in butter/garlic, perfect tenderness! 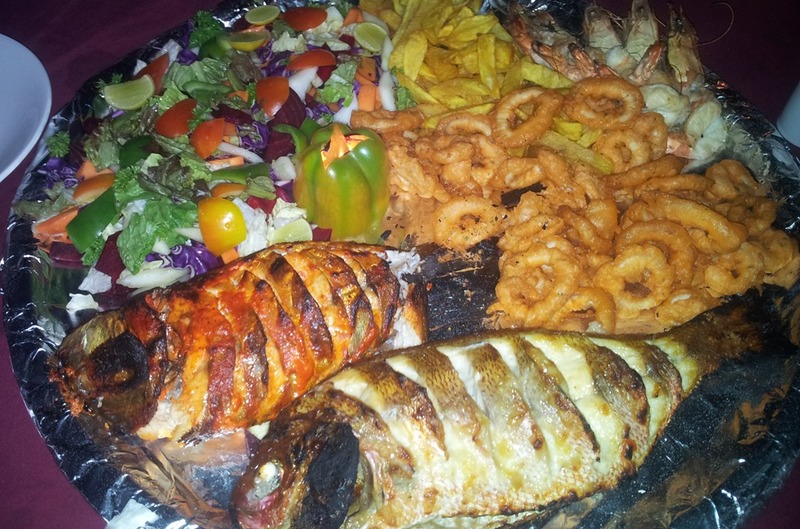 ), and last – our dinner from a different night – a platter of 2 fish, more calamari, prawns, chips and salad. 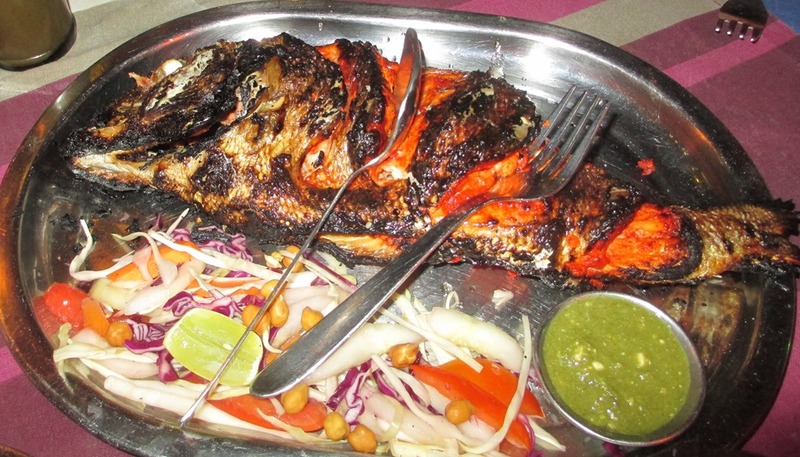 I have to say this was all the best seafood we have yet had in India. Our vacation in Kerala is done and an excellent time it was. 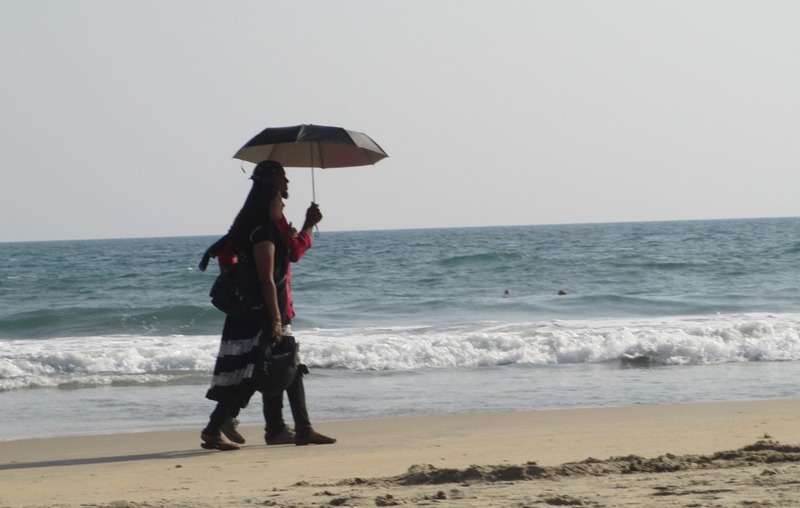 As you can see from these pix of Papanasam Beach, where we were, there were clear skies and ample beach with soft sand … just the thing for relaxation, by Salazar tastes. It was also a great time to see a slice of South India, in many ways the same but in other ways, quite different from the north, such as Pune in Maharashtra where we live. 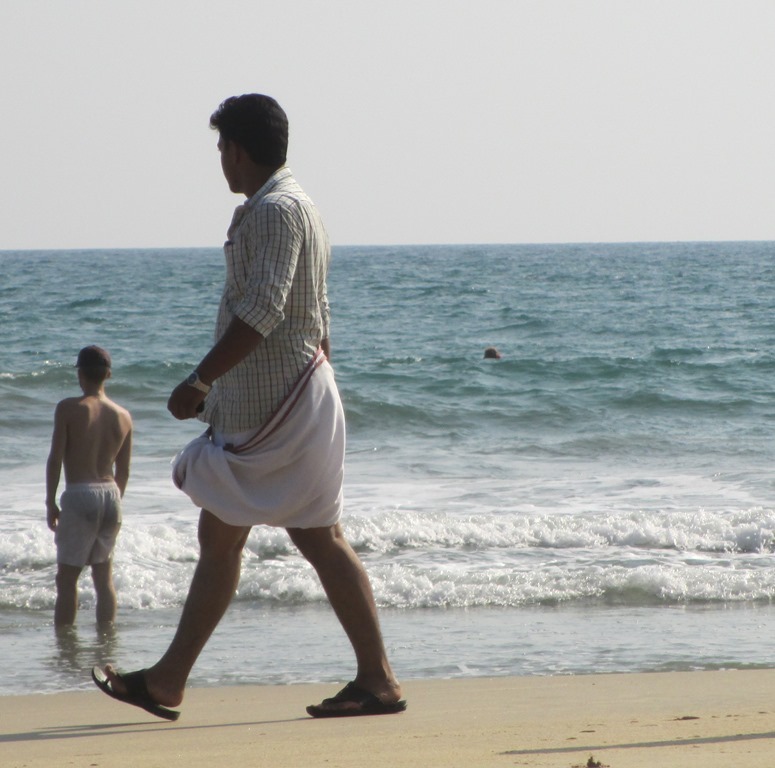 A pretty versatile garment, there’s several ways to go about in your lungi. You might let it drape down, which gives a cool, slightly formal look. 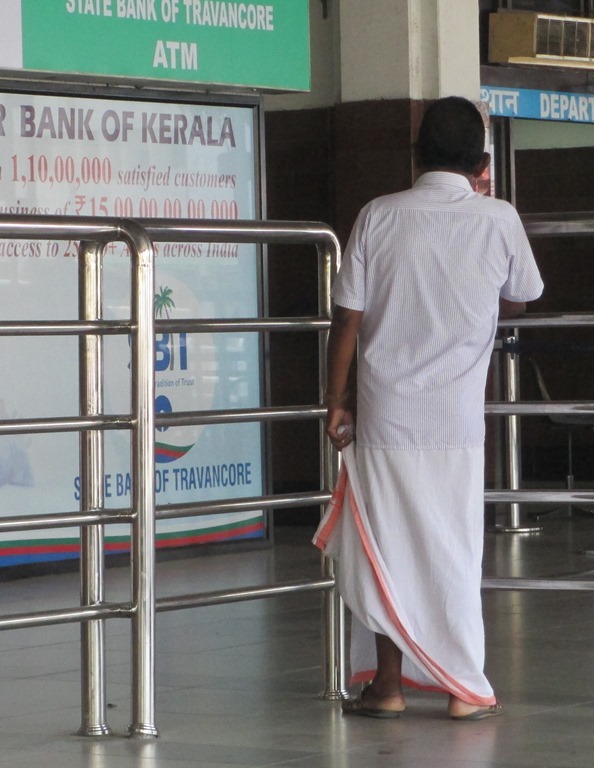 Or, you might hold one corner, maybe as our airport-goer on the right is doing; this keeps the folds from binding your knees if you want to walk quickly – in fact many men sort of lightly flap their lungi with a kind of jaunty motion as they walk. Finally, you can grab both edges, fold them up, and knot them in front, as our beach-walker is doing – this is the way for walking fast or doing work. I thought about trying the lungi myself. 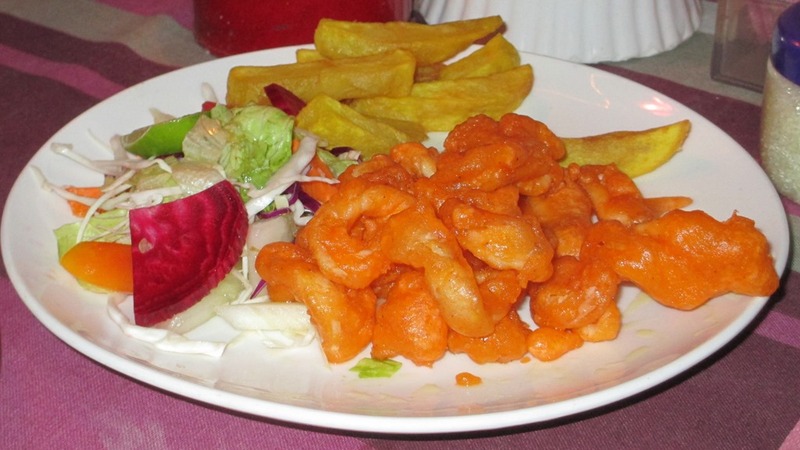 In the end, despite the clear comfort – it’s the tropics, after all – I decided against it. I think we westerners often look comical in Indian dress, and with the possibility of wardrobe malfunction from an improperly secured lungi, I decided to hold off, perhaps till another visit. 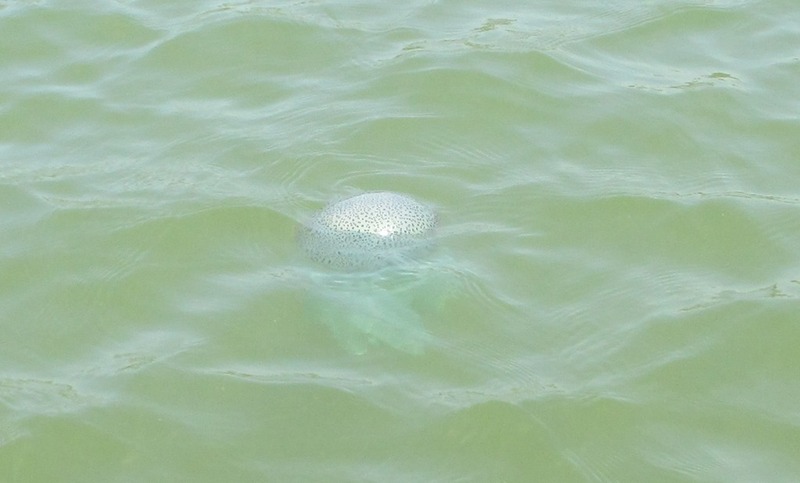 Once the water is reached, they will turn around and drop the offering behind. Then they will rinse themselves all over with the water. 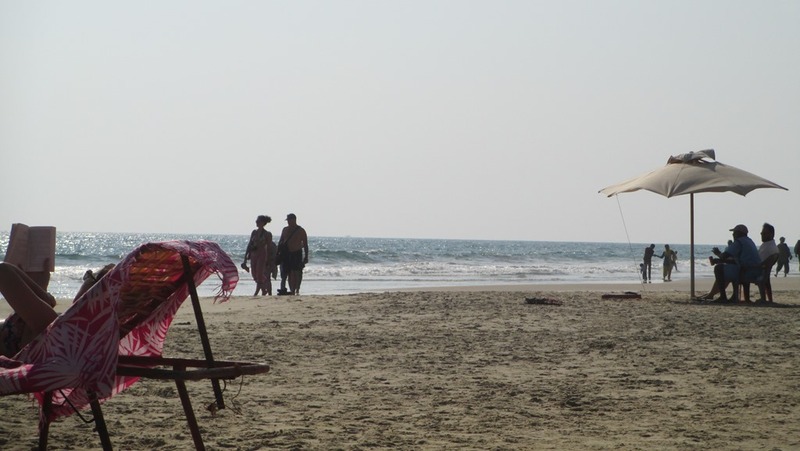 Western women in bikinis, and Indian men in long-sleeve shirts and lungis and Indian women in saris or kameez. 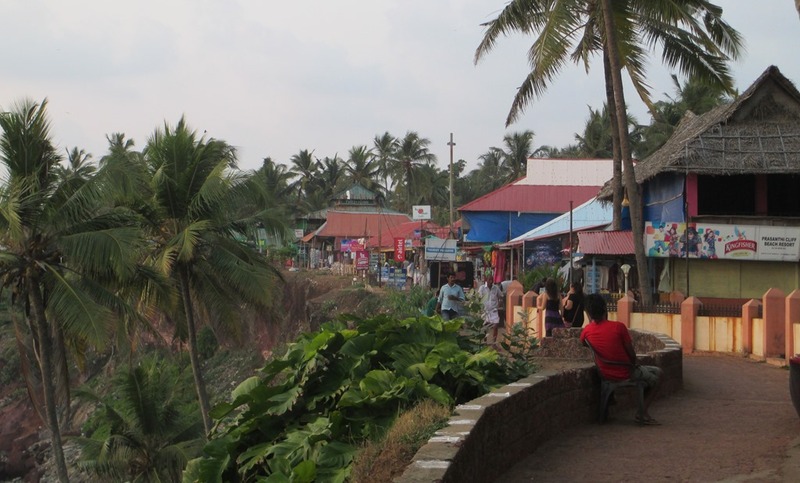 At Varkala both sides peacefully coexist, but the divide between the two worlds is as constantly glaring as the tropical sun itself. Atop these cliffs are guest houses, shops and restaurants. You can reach them from the beach via stairs – somewhat eroded and without rails for some places, the stairs are tricky to navigate in the dark. 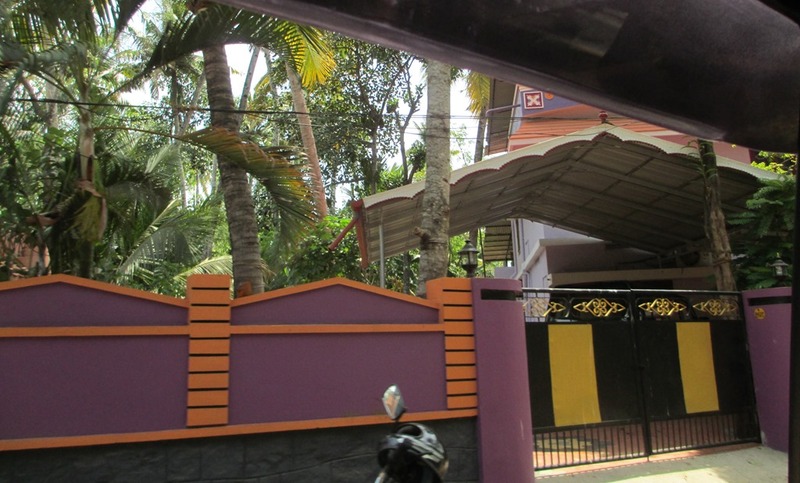 In just a few hours myself, Kim and Morgan depart for the southern-most state of India, Kerala, there to vacation for 5 days at Varkala Beach. As you can see from this Google Maps capture, Varkala is pretty far south – only 8.7 degrees north of the equator, it is at roughly the same latitude as Somalia, Ivory Coast and, in South America, Panama and Venezuela. Weather for our time there will be in the 90s F, clear and sunny. 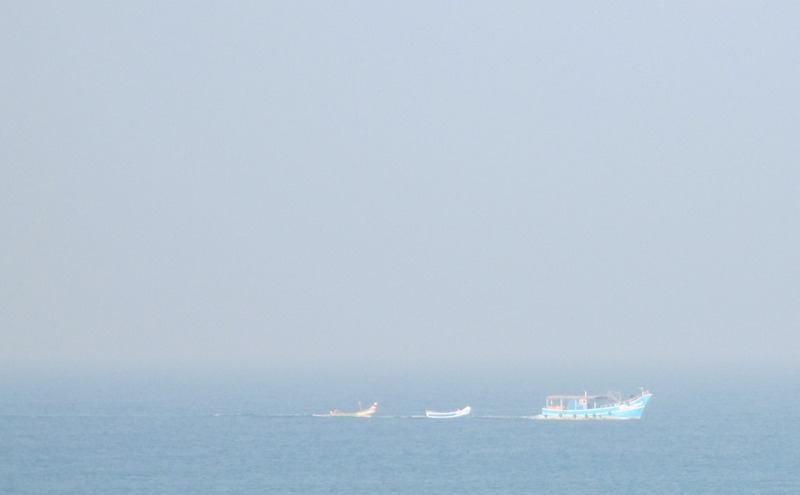 The beach is below a cliff; our hotel is atop the cliffs and looks out over the Arabian Sea. From my reading, Kerala is an interesting place: It is the state with the highest literacy rate in India, and oddly also with one of the highest rates of alcoholism. There are a great many elephants in Kerala – which we plan to visit – as well as numerous lakes and waterways, which we also may visit but, truthfully, we Salazars are mainly looking forward to beach time and scanning the horizon for dolphins that are said to swim thereabouts. 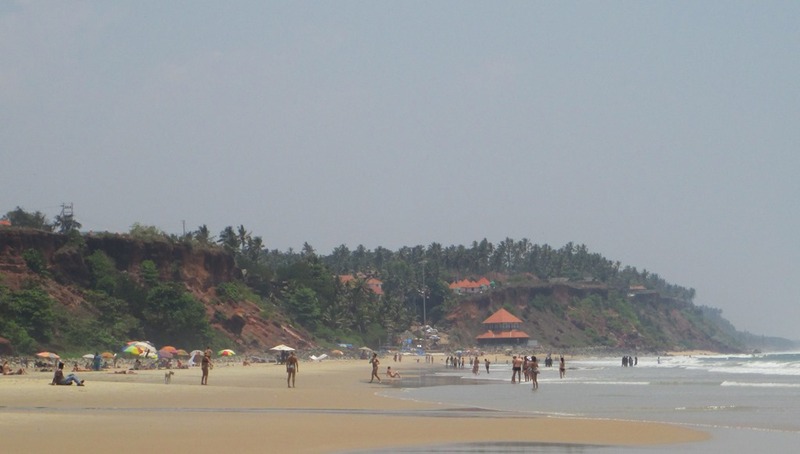 The beach we will be at is called Papanasam, often called the “sin destroyer”, because its waters are thought to wash away sin. 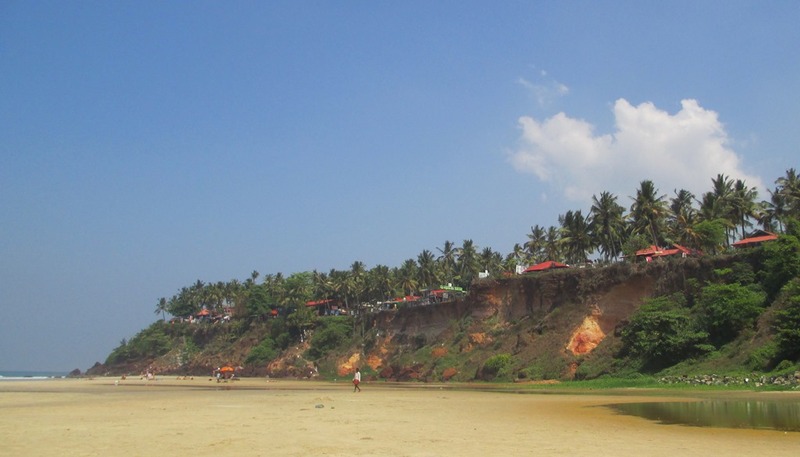 It is a tourist place, and one many foreigners visit, but the beach also has great significance to Hindus. There it is considered a very meritorious thing to perform a special puja on the beach with the ashes of the departed. Soon we will learn more. Now, all I can say is, if the dolphins can take it, so can we. Pictures and a full report when we get back. 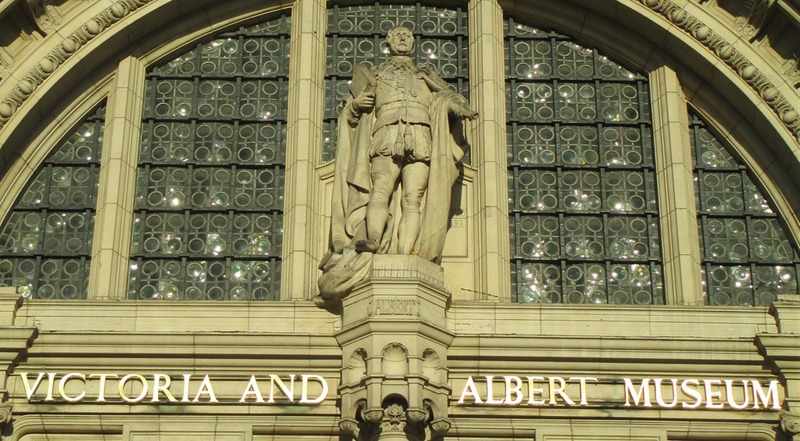 I know that’s a great many pictures … I hope if nothing else this conveys the immense breadth of what’s to be seen at the V & A. I took over 250 shots there, and daughter Alex took many more as well. Things we could show you include: Richard Burton’s costume from his Stratford-on-Avon Henry V (1951); The Valkyrie costume from The Producers (2004); the amazing “castings gallery”, where architectural works, some stories high, have been re-created in plaster; the ironworks collection; the 20th century design hall, including the Garden Egg chair; the Montefiore Centerpiece, 37 kg of sterling silver with as baroque a rendition of Moses, Ezra and David as you could imagine; plus paintings, jewelry, fabrics and every-day items beyond counting. Drops the forgotten blossom from her hand. The thing museums make me wonder more than anything else is: Are we – people, humanity, all of us – different now than we were before? 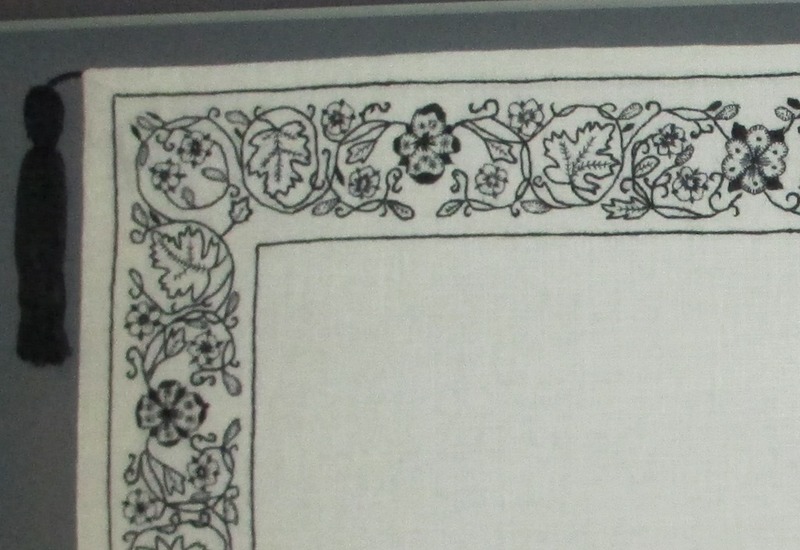 Does the sentiment of Rossetti, or the devotion of the embroiderers or chasuble makers, or the vision of the sculptors who chose gods as their subjects, does any of that still exist? 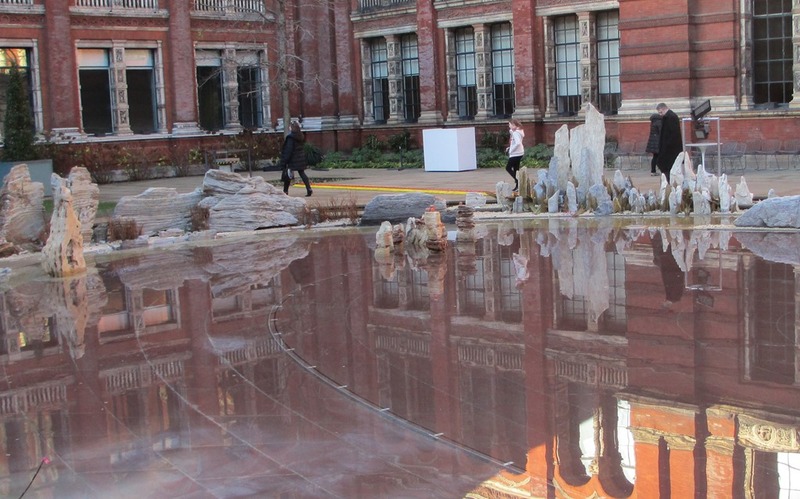 Or have we become over-fond of the “realistic”, the cynical, the clever, the – frankly – small? If you tell me Rossetti’s painting is puerile, contrived, and shallow, I know what you mean. 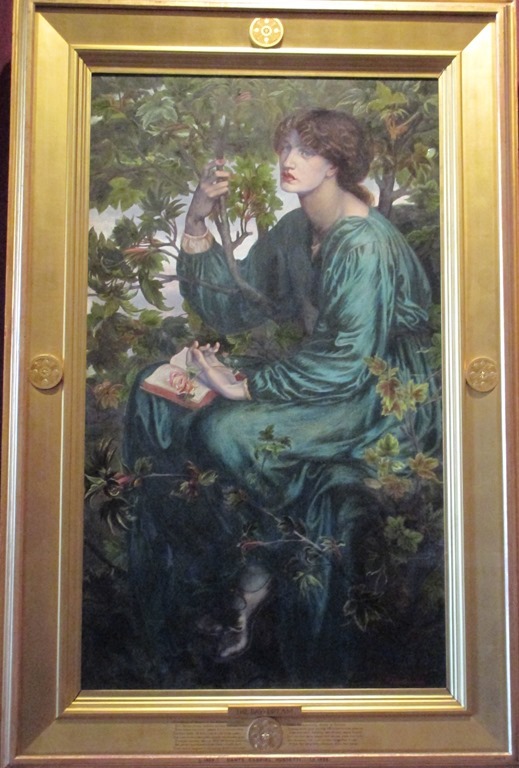 But I still like it, and I wonder what Rossetti really thought when he painted it. Thus, finally, ends the chronicle of our London trip. 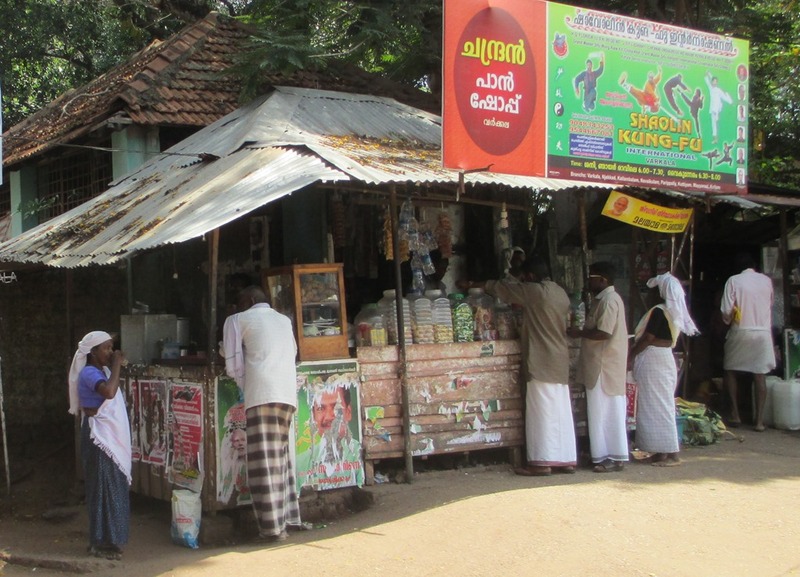 I hope to get back to more India postings soon, such as the planning for our end of month trip to Kerala. Namastē. Afraid further pic-posts from our London trip will have to wait, as I am later today off to the US for our yearly Collaboration-Services Conference, IBM Connect 2014. There among the things I will do is present an hour-long session in video-panel format, with 10 developers from my worldwide team answering questions and sharing insights about IBM Sametime. Though I have no fears about the software holding up, networking at these events is always tricky, so wish me luck. But before I go I wanted to award a Mighty Marvel No-Prize to my good friend Tom, who correctly identified the location of the crowd-shot in my last post as The Rosetta Stone. The shot above is closest I could get and was taken 1-handed with camera aloft. I guess seeing as this is an artifact at the British Museum that virtually everyone has heard of, it’s not surprising people would cluster round. 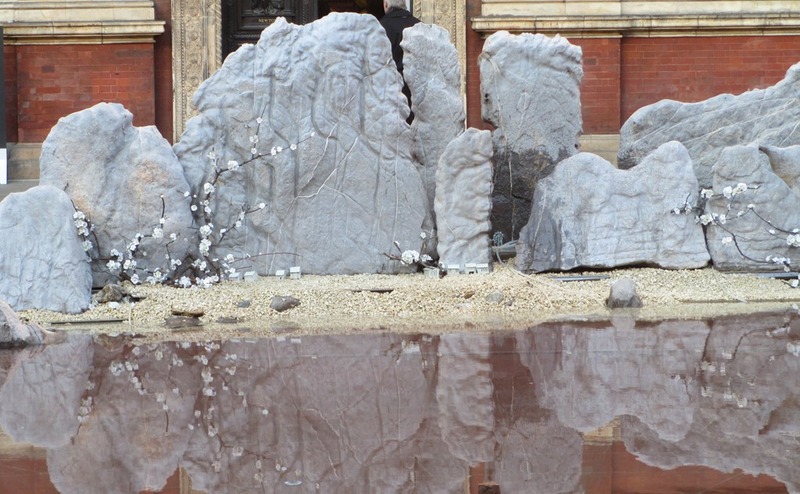 But for those of us who read neither hieroglyphics, nor demotic, nor ancient Greek (the three languages used on the stone) I can only say it is a nice stone indeed, of impressive heft and neatly done carving, and one that would be a great conversation starter if displayed in the family den. Now, back to a few hours of work, including some rehearsal for my talk, and then at 6:30 pm my time I embark to Mumbai to begin the journey towards Orlando and all things Collaborative and Mousey. I should land in Florida around 6 pm Saturday local time, for an elapsed travel time of about 35 hours. Such are the joys of international business life.